The Gauteng Foundry Training Centre (GFTC) situated at the Ekurhuleni East College (EEC) in Kwa Thema Springs, is urgently seeking a qualified Moulder to join their training staff. For any further information, please contact the SAIF office mbiljon@uj.ac.za. This annual event is hosted for paid-up SAIF Members ONLY and allows for suppliers to the industry as well as foundries to engage with their customers while supporting the institute. Members are encouraged to contact Marina Biljion at the SAIF office as soon as possible to secure a booking or to confirm sponsorship for the event. We are very appreciative of all donations of spot prizes and special prizes received for the day. 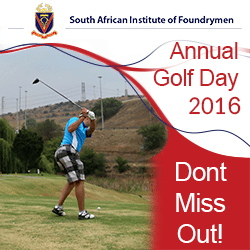 Bookings are limited to three (3) fourballs per company and must be submitted to our offices by no later than 20 October 2016. The online registration for the 2nd South African Metal Casting Conference is now open. The MCC will be held concurrently with the WFO Technical Forum and 7th BRICS Foundry Forum from 14 - 17 March at Emperors Palace in Gauteng. We are proud to announce that paid-up members of SAIF will qualify for discounted conference rates and exhibition space. Please register online by choosing one of the conference packages. * Please note: Day packages include attendance of the conference and exhibition, a delegate bag, USB with conference presentations, meals for the day and the evening function of the day. Student Conference Packages will be made available soon.